Cyclamen are one of the best of the seasonal flowering plants, and quite easy to maintain for many months if the golden rules are followed. Like some fruit which seem to be available all year (but not taste too good when out of season! 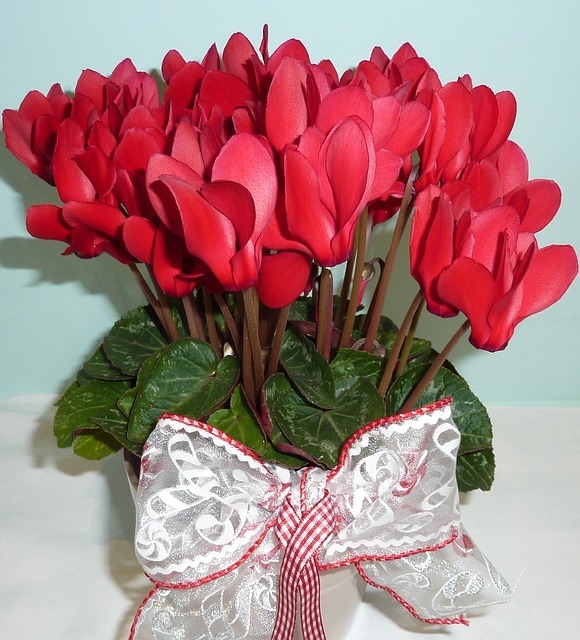 ), it’s best to delay purchasing your cyclamen until mid March each year, thus avoiding the “force grown” ones that proliferate in bad florists and chain stores and give Cyclamen a bad name. We buy only from the best growers in Australia, and their plants are usually ready from early April each year. Once the cool nights come, Cyclamen of superb quality arrive, with some of the specimen plants having up to twenty or thirty flowers in a wide range of colours from pure whites through pastel and hot pinks and on to magentas, purples and bright reds. All Cyclamen have the same basic requirements of light, temperature, moisture and maintenance. Cyclamens need to be sited in as light a spot a possible, preferably a sun room, or at least near a window. Winter sun will not burn either the flowers or the leaves unless the plant is right against the window where the sun's rays are magnified, but lack of light will soon see the flowers losing their upright habit because the stems become too weak to support the weight of the blooms. Temperature control is the next most important aspect, and one that is easily forgotten. The natural flowering time for Cyclamens is winter, so they adore cold conditions and abhor too hot a position, particularly at night. Their native heritage is areas such as Greece and Turkey, where they flourish in the cold winter climate, and tolerate both frost and snow, so it is wise to put them outside at night, away from the roaring gas fire! If it is raining, particularly a light drizzle, then so much the better, as new flower buds will be readily formed, although you need to ensure nomadic snails and slugs don't find a new home in the pot! As far as watering is concerned, unless your house is excessively heated a small amount of water once or twice per week should be enough. Too much water is the easiest way to kill a Cyclamen! If the plant is exposed to the rain, simply allow it to drain freely before putting it back inside, or leave it outside under cover for a day or two to enjoy itself. It's a good idea anyway to give your plant the occasional rest outside, and you will almost certainly get better and longer flowering if you do. A light ration of Liquid Potash or half strength Aquasol every week or so is also desirable. Finally, the most important task is to remove the old flower stems and yellow or broken leaves as soon as they appear. By grasping the leaf or flower stem between thumb and forefinger as near to the soil as possible, and gently twisting and tugging, you will break off the old stem and remove the possibility of it rotting and causing fungal problems. Rest assured that a couple of minutes maintenance each week will reward you many times over by ensuring a happy plant that will continue blooming for three to six months at a fraction of the cost of cut flowers! 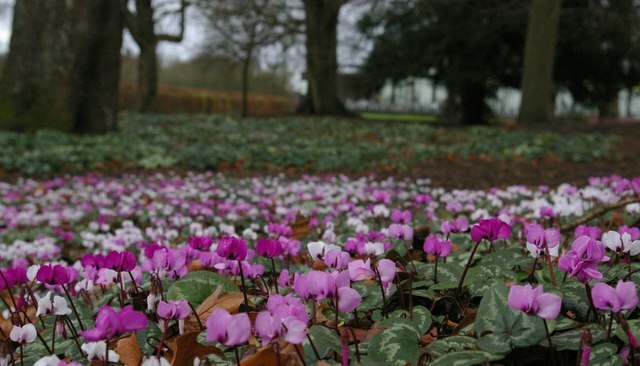 What’s more, whilst the cycle of Cyclamen means they usually hibernate over summer (the opposite of Bears and Snakes! ), our Cyclamen will often keep a few leaves through summer and can regain their former glory the next autumn, and flower this way for years!